Yet another UI, but this one is a bit special. Use /LSUI to open in-game config. If you found a bug or want to share an idea on how to improve my UI, either use the issue tracker on GitHub, or post a comment on WoWInterface or Curse. Feel free to write feedback on how to improve some class-specific features. However, keep in mind that I'm not going to implement any features as a replacement for BIG addons. Feel free to add and/or review translations on Curse, alternatively, you may create a PR on project's GitHub page. - Updated Simplified Chinese translation. Translated by aenerv7@Curse. - Fixed minimap zone text updates. NOTE: You'll have to restart WoW client to make things work after the update. - Player's buffs, debuffs, and totems are now hidden while doing pet battles. - Fixed action buttons' icons' colouring. - Fixed the default castbars' skin. NOTE #1: You'll have to restart WoW client to make things work after the update. - Updated both Spanish translations. Translated by Gotzon@Curse. Unit frame health percentage in brackets possible? "120 Runic Warrior 54.7K (82.8%)"
Not a huge deal (this is far and away my favourite UI), this slight change would only make it better for me personally. Perhaps there's some simple lua change involved? Now I know how: Click! Last edited by Deadlyz : 04-16-19 at 03:31 PM. Originally, I was planning to use that animation on multiple elements, on unit frames, on xp bars, etc, but over time those elements were either reworked or removed altogether, in the end the only element w/ that animation that's left was the xp bar. So I chose to remove it from there as well. I see. Ty for answering. If you don't mind me asking, why were the animated effects removed from the UI? Was it to increase performance? Although I don't remember the UI ever having any significant impact on my FPS. I feel like those effects would fit the XP bar perfectly. Last edited by lightspark : 04-09-19 at 09:23 AM. Looks awesome! Ty for taking the suggestion to heart. Last edited by lightspark : 04-08-19 at 11:33 PM. Hey LS, let me throw an idea at you. Have you ever considered making the artifact xp/azerite necklace's bar resemble actual azerite as it is portrayed in the game? This Power Bar popped up during a quest for me today and all I could think about was how well it would fit the whole glass look of the LsUI. I know some portions of the UI like the xp and bag bar used to have some cool animation/effects a while back. Something like that might take this idea to the next level if done right. Last edited by lightspark : 04-08-19 at 09:25 AM. Last edited by Heybarbaruiva : 04-07-19 at 02:29 PM. The arrow buttons on the bottom panel don't appear. After disabling the addon the quest was fixed. I'll look into it the next time this quest pops up in my region. Love this UI, but is there a way to display damage text, or any way to enable the default damage text to be displayed? 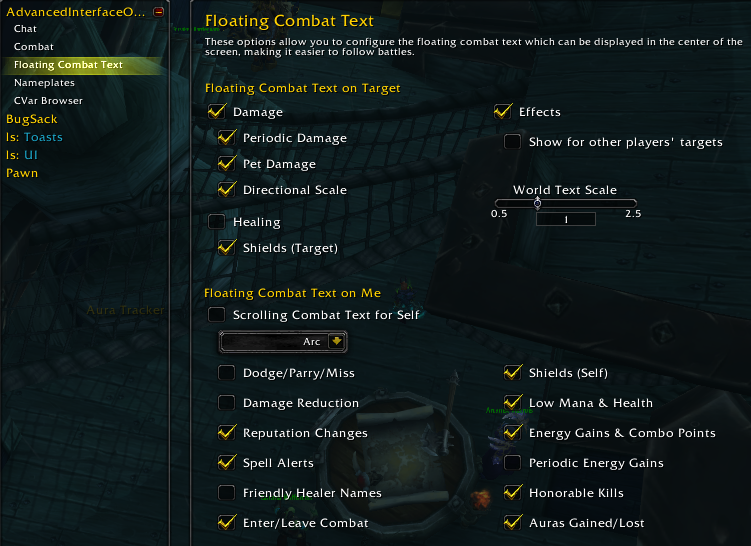 There's no proper combat text option in this UI, but to enable and control the default floating combat text you might want to install AdvancedInterfaceOptions, it gives you access to a lot of settings that were removed by Blizz from their own config. Something that would be nice is a minimap tidy up option. Like a button on the minimap to click to toggle perhaps a box below it (or some other side defined in the options panel) with all the buttons in 1 area. At the moment I have 6 (BugSack, Details, SimulationCraft, WA, DBM and Method Dungeon Tools) where 3 of those you can remove the minimap button. However, it would be nice just to have an option to hide them all. So the special action bar that comes up for certain quests and vehicles I get no keybinds. Does this action bar use the same keybinds as the main action bar? I dont use keybinds for the main action bar becuase of the way i the other action bars are layed out for me. That's exactly right, when you switch from a normal action bar to a vehicle/override one, it hijacks keybinds. How come we cant do anything with the main action bar like resize it or move it? Disabled restricted mode: /LSUI > Action Bars > uncheck the "Restricted Mode" button. You can't resize/position the main action bar and other elements attached to it because of all the artwork and animations. Last edited by lightspark : 03-13-19 at 07:51 AM. Last edited by lolmaru : 03-12-19 at 05:14 AM.